Abstract: In this paper, a control methodology is proposed to address the problem of energy management in hybrid ships in the presence of disturbances applied by the surrounding environment and taking the uncertainties within the ship model into account. Nonlinear Robust Tube-Based Model Predictive Control (NRTB-MPC) is adopted to control the ship speed and calculate the demanded energy for propelling the ship. 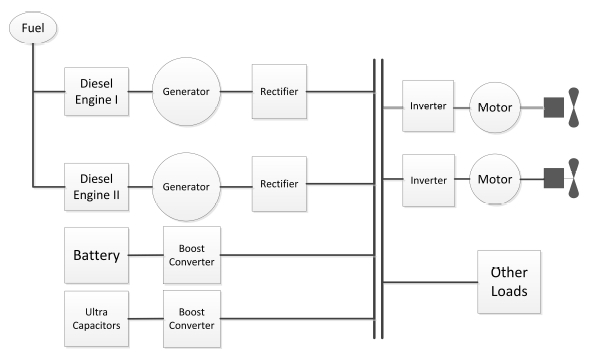 At the same time, a conventional MPC approach is proposed to track the demanded energy and determine the optimal split between different energy sources. Simulation experiments using a hybrid ship system illustrate the potential of the approach. Reference: A. Haseltalab, R.R. Negenborn, G. Lodewijks. Multi-level predictive control for energy management of hybrid ships in the presence of uncertainty and environmental disturbances. In Proceedings of the 14th IFAC Symposium on Control in Transportation Systems (IFAC CTS 2016), Istanbul, Turkey, pp. 90-95, May 2016.